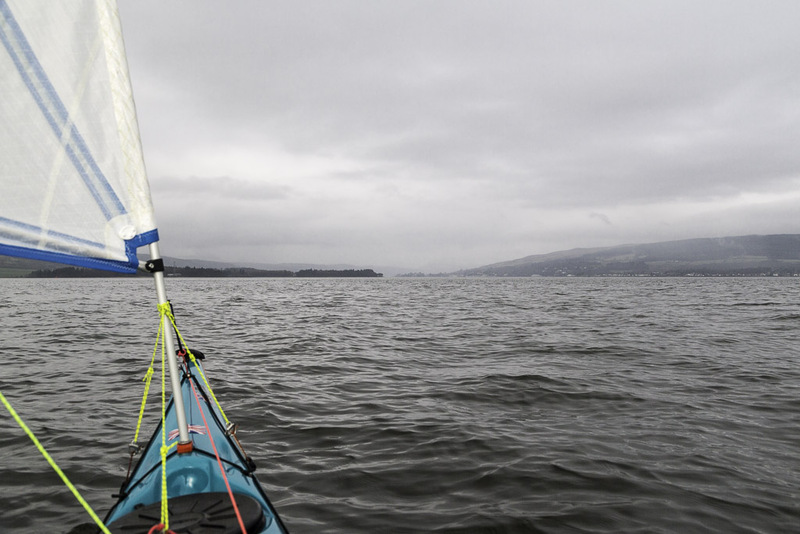 Sea kayaking with seakayakphoto.com: Betwixt and between two points on the Clyde. Betwixt and between two points on the Clyde. Before we left the wreck of the MV Capytannis we savoured her fine position in the Firth of Clyde. Away to the west the Firth divides into three. 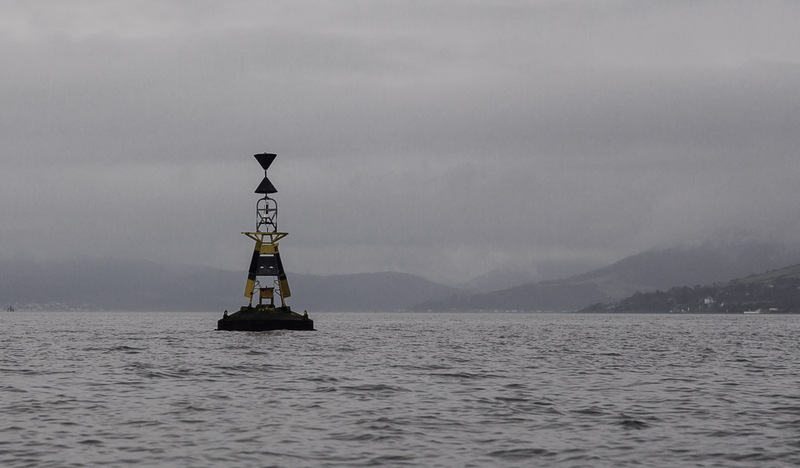 On the left the exit to the open sea, Straight ahead the entrance to the Holy Loch and to the right, the entrance to Loch Long.The two points pointing together on the cardinal buoy mean it is safe to pass to its west. 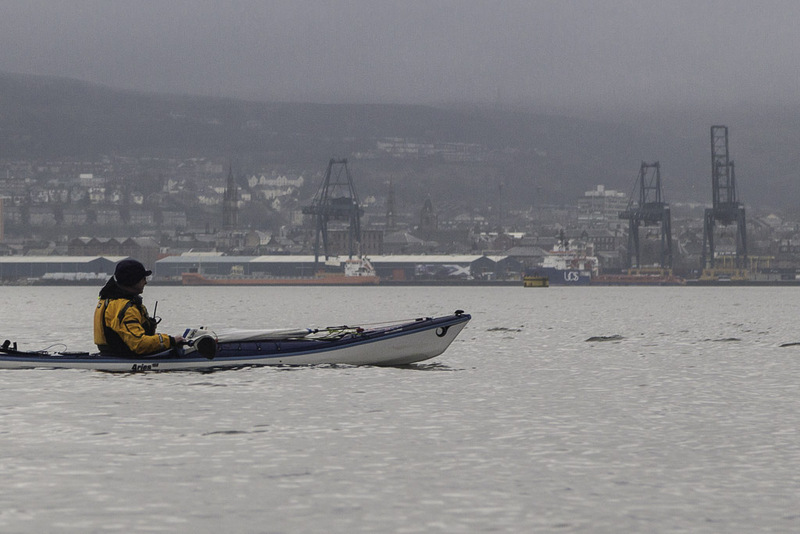 The cranes of Greenock's container terminal rose into the mist to the south. Sugar refining, which brought the Sugar Boat to Greenock, began here in 1765. At one time Greenock had 12 sugar refineries but Tate and Lyle, the last, closed in 1997. Since then there have been no more sugar boats on the Clyde. ...on Rosneath Point, which is on the opposite side of the outer entrance to the Gare Loch. The ancient rocks between the two points were cut away by the glacier which formed the Gare Loch in the relatively recent geological past. ...conglomerate rocks that are found at Ardmore and Rosneath Points. Conglomerate rocks were formed when Scotland was situated about the equator.The various sized pebbles that are trapped in the sedimentary sandstone are mostly greenish schist and whitish quartz. 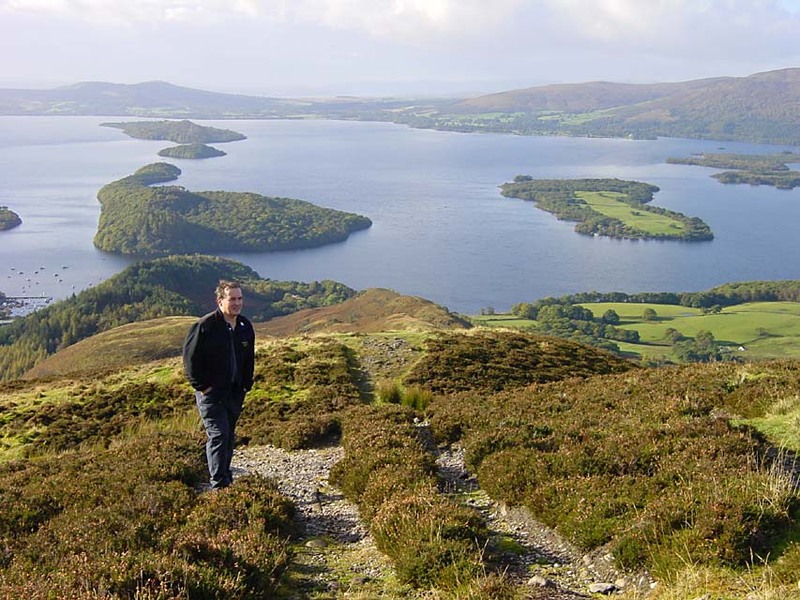 Interestingly Loch Lomond, which is now a fresh water loch, was once a sea loch off the Firth of Clyde (just like the Gare Loch and Loch Long are today). After the last Ice Age, sea levels were higher and sea water covered the lip (that is 9m above sea level) that retainsLoch Lomond today. 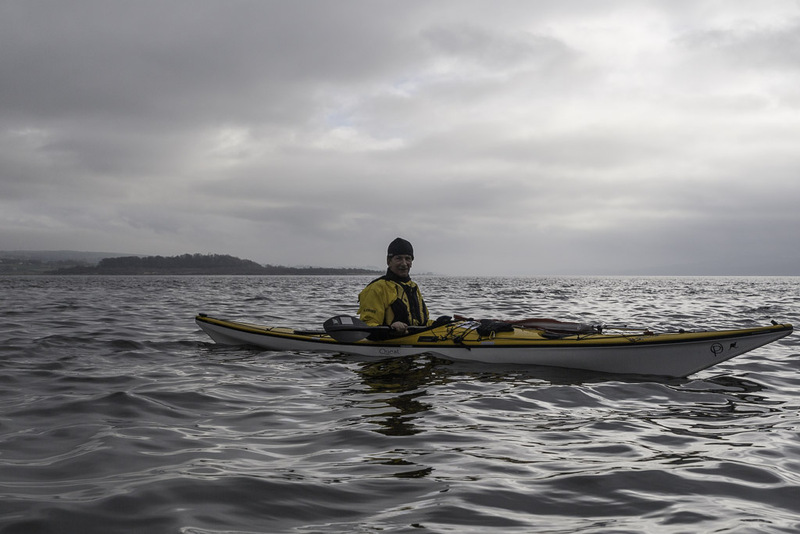 As sea levels dropped, Loch Lomond was cut off from the sea, isolating many shoals of marine fish. As the water gradually became fresher most of the sea fish died out but some survived and gradually evolved to live in what is now totally fresh water. These are called powan a freash water "herring" which are descended from a common salt water ancestor of present day herring in the sea. Powan are found in only a handful of lochs and lakes in the British Isles. They are only naturally found in one other Scottish loch, Loch Eck, which once connected to the Firth of Clyde through the Holy Loch. 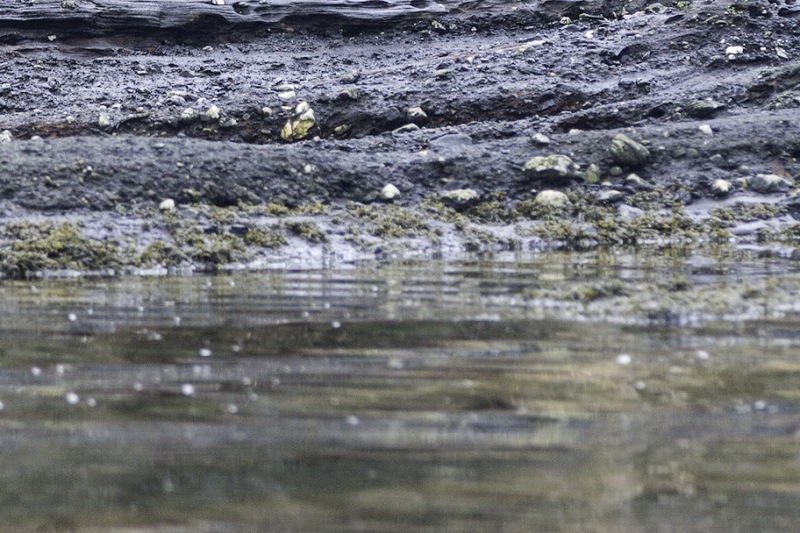 Each of the British Powan species is genetically distinct as they have been isolated from each other since they were trapped in their loch or lake.